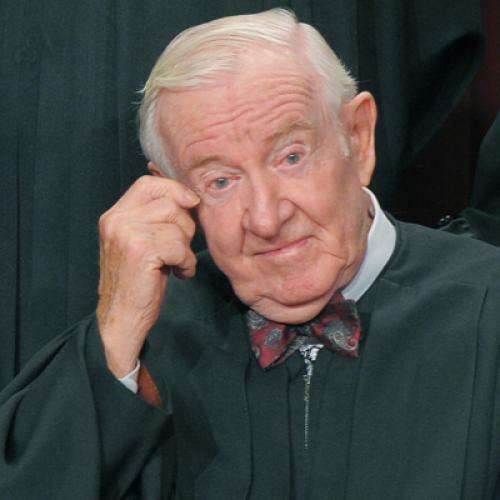 Why has everyone fallen for John Paul Stevens’s self-serving narrative? Commentators have embraced Stevens’s preferred self-image, largely portraying him as an island of stasis amid a sea of dynamism. Adam Liptak dutifully relayed the justice’s assessment in the Times earlier this month: “His views have generally remained stable, [Stevens] said, while the court has drifted to the right over time.” But, while the Court, the GOP, and the nation as a whole all became more conservative during Stevens’s tenure, these trends do not negate the fact that Stevens has also tacked hard to the left. Indeed, examining his early years on the Court reveals rulings that would be unfathomable coming from Stevens today. While his early record is habitually described as “quirky,” it is underappreciated that this quirkiness often took Stevens in conservative directions—particularly in cases involving society’s most contentious legal disputes. Rather than applauding Stevens for a nonexistent steadfastness and misremembering the justice that he once was, the legal left should instead be content to celebrate the admirable justice that he has become. Puncturing the myth of Stevens’s judicial consistency could also serve to mute some of the left’s more overwrought mourning for the demise of country-club Republicanism. Stevens—with his wealthy background, ongoing devotion to golf and tennis, and membership at four country clubs around the nation—is an archetype of the GOP establishment from a bygone era. To the extent that some of Stevens’s initial opinions on the Court can be viewed as articulating the legal views of the Skip and Muffy set, it becomes clear that searching social reform seldom originated on the back nine. Stevens, like many of his fellow Republican-nominated justices, took some time before moving decidedly to the left. During the course of his career, however, Stevens has voted both to strike down affirmative action in higher education and to uphold affirmative action in business. In 1978, Stevens wrote an opinion seeking to invalidate a medical school’s efforts to achieve a racially diverse student body. Although he admittedly would have decided the case on statutory (rather than constitutional) grounds, Stevens appealed to the very same colorblind principle that motivates affirmative action opponents today. “The University of California through its special admissions policy excluded Allan Bakke from participation in its program of medical education because of his race,” Stevens began in his oral statement from the bench. In 1995, moreover, the Court adopted Stevens’s earlier skepticism of programs designed to aid minority-owned companies (albeit not his reasoning that such programs smacked of the Third Reich). By then, Stevens had changed positions, and he wrote a powerful dissent urging the Court to recognize the distinction between inclusive and exclusive uses of race. It may well be that treating all racial classifications identically “doesn’t make any sense,” as Stevens told Rosen in the wake of the Court’s invalidation of two voluntary school-integration programs. If that is so, however, Stevens passionately advocated a senseless position for many years. Although Jeffrey Toobin’s recent New Yorker profile granted that Stevens has “evolved” on race and capital punishment, it nonetheless furthered an erroneous conception of consistency in other high-profile areas. The piece quotes former federal judge Abner Mikva, an old friend from Chicago, describing Stevens as fiscally conservative, but noting that “he was always a great progressive on civil rights and social rights.” In this vein, Toobin asserts: “Stevens has always supported abortion rights and an expansive notion of freedom of speech.” The truth, though, is a good deal more complicated. Stevens’s most significant early opinions as a justice involved the First Amendment. Over the last two decades, he has been a generally reliable defender of free speech. Yet this was not always so. In a 1976 case decided by a 5-4 margin, Stevens wrote a plurality opinion that approved governmental zoning regulations regarding where adult films could be shown, even if those films had not been deemed legally obscene. The plurality opinion rejected the then-prevailing categorical approach to speech and paved the way for increased content-based regulation. “[F]ew of us would march our sons and daughters off to war to preserve the citizen’s right to see ‘Specified Sexual Activities’ exhibited in the theaters of our choice,” Stevens wrote. It is a cute line, but it also articulates a test that, taken seriously, would permit the government to censor unpopular speech that is vital to democracy. Turning to cases involving criminal defendants, Stevens told Rosen that his father’s (apparently wrongful) conviction for embezzlement influenced his judicial thinking. This conviction taught Stevens “that the criminal justice system can misfire sometimes.” Examining Stevens’s first full year on the Court nevertheless reveals a justice who often appears unsympathetic to criminal defendants’ rights. To select only one of the many available examples, Stevens wrote a dissent in Doyle v. Ohio contending that it should be constitutional for a prosecutor to cross-examine a defendant regarding his failure to offer an exculpatory story immediately after being arrested and receiving Miranda warnings. It is difficult to understand how such a view would not have effectively eviscerated the right to remain silent. Today, in stark contrast, Stevens views Miranda as sacrosanct, leading him in February to be one of only two dissenters who would have held unconstitutional a Florida police department’s minor deviation from the standard warnings. Stevens’s marked ideological shift merits scrutiny not least because he treads upon a well-worn path. In the post–World War II era, a strikingly large percentage of Republican-nominated justices have disappointed conservatives after being installed at the Supreme Court. President Eisenhower reportedly called Earl Warren’s nomination “the biggest damn-fool mistake I ever made.” Had Ike lived beyond 1969, though, he may well have reserved that ignominious distinction for another justice he placed on the Court, William Brennan. In subsequent years, Harry Blackmun, David Souter, and, of course, Stevens became stalwart members of the Court’s liberal wing. Apart from these outright apostates, moreover, several other GOP-backed justices have bucked conservative legal orthodoxy in prominent cases. Lewis Powell, Sandra Day O’Connor, and Anthony Kennedy have all at various times been deemed judicial traitors. If liberals have been disappointed with recent Court decisions, imagine how dreary constitutional conditions would be had Republicans competently selected justices to implement their preferred judicial vision. Almost five years into Roberts’s tenure as chief justice, he and Samuel Alito have betrayed few signs of unleashing their inner liberals. After several decades of misfires, Republicans appear to have learned their painful lesson. Experience suggests that the line separating judicial turncoats from judicial loyalists—for the GOP, at least—runs along the banks of the Potomac. Over the last four decades, staunch Court conservatives have spent substantial periods working in Washington for Republican administrations before being nominated. In addition to Roberts (White House counsel’s office) and Alito (Office of Legal Counsel), that list includes William Rehnquist (again OLC), Antonin Scalia (yet again, OLC), and Clarence Thomas (Equal Employment Opportunity Commission). Many contend that sustained executive branch experience serves to inoculate potential justices from the “Greenhouse Effect.” Judge Laurence Silberman famously invoked this term to describe the judicial machinations of conservatives that were designed to win praise from the liberal media as personified by Linda Greenhouse, The New York Times Court correspondent from 1978 until she gave way to Liptak in 2008. Perhaps tellingly, the modern Republican-appointed justices who have often sided with the left had their formative pre-Court professional experiences outside the Beltway. Unless future Republican presidents decline to select Court nominees who have been tested in the D.C. cauldron, it seems unlikely that anyone on the right will have occasion to rue the Liptak Effect. Although the sentiment has been badly overworked, it must be stated that, whenever he chooses to exit the stage, we may not soon see the likes of John Paul Stevens again. Justin Driver is an assistant professor at the University of Texas School of Law.